I'm a self-professed chocoholic, and so was my companion. 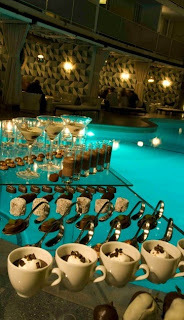 Yet we both had to wave the white flag after morsels and morsels of chocolate desserts were brought out to us at Avalon Hotel's Oliverio. I don't think I've indulged in so much chocolates in a while! About a month ago, Oliverio started Chocolate Salon, a chocolate buffet spread out next to the pool of the Avalon Hotel every Friday and Saturday nights. 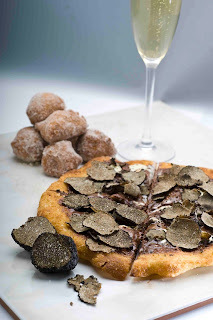 For $28 per person or $50 per couple, guests can partake in offerings such as the triple chocolate truffle pizzetta, chocolate martini, white hot chocolate, spicy chocolate pot de creme, and all manners of chocolate dipped goodies. I was invited by the restaurant's PR to try it myself, and my companion and I came ready for battle. It was raining so instead of setting up a buffet at the pool, the restaurant plated everything. 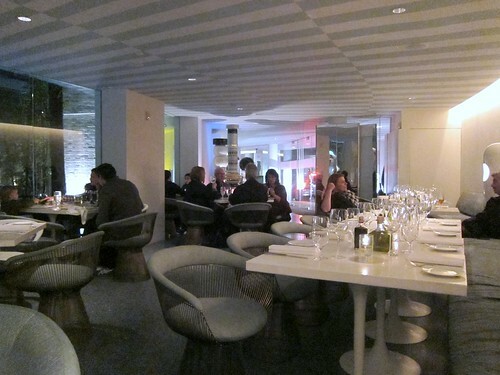 We sat at the small lounge/bar area which extended from the restaurant instead of in the cabanas. We thought we should have a light dinner before digging into dessert, so we ordered some appetizers. On one hand, it was good to have something savory first. On the other, if we hadn't we would've had more room for more chocolates. 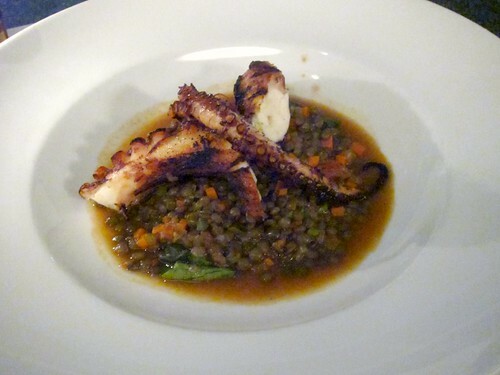 The octopus was particularly tender and flavorful. This seemed pretty pricey although the buffalo patties were pretty thick. 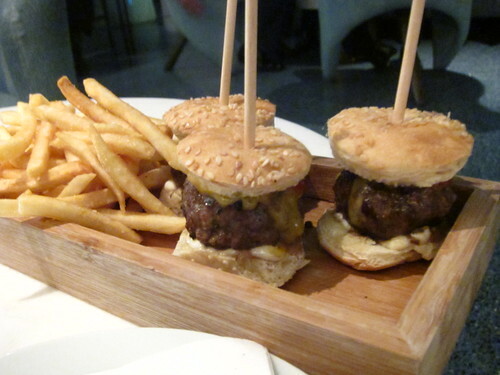 I personally prefer my sliders/burgers to be stuffed with tomato, lettuce, etc though. 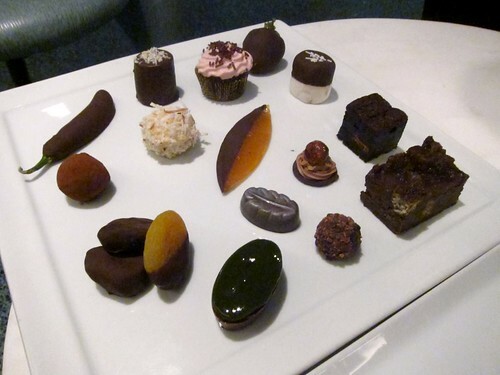 After these appetizers, we started with the Chocolate Salon. 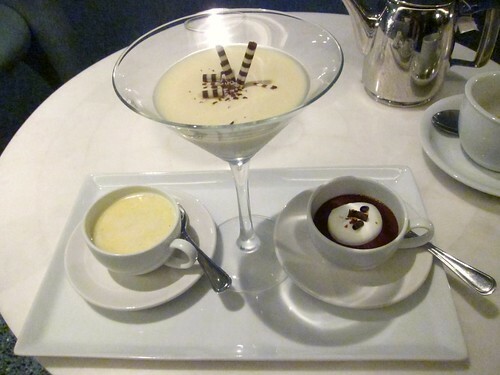 First they brought out a trio plate of Hot white chocolate, panna cotta, and chocolate chili pot de creme. I am usually not a big fan of white chocolate, but we both really enjoyed the hot white chocolate. The chocolate chili pot de creme was just a wee bit too spicy for us, but I can imagine many of you would really like it. One of the highlights of the night for me was the Triple Chocolate Truffle Pizzetta. A small, warm pizza covered with chocolates, melted chocolate chips, and topped with fresh black truffle shavings. I was skeptical about this at first as I wasn't sure how the two flavors would mesh together, but I was very impressed. The earthiness of the truffle actually worked very well with the bittersweet chocolate, and laying atop the warm melted chocolate enhanced the aroma of the truffle. Chocolate banana bread pudding, brownie, chocolate covered marshmallow, strawberry, banana. Dark chocolate ganache with mint wasabi. 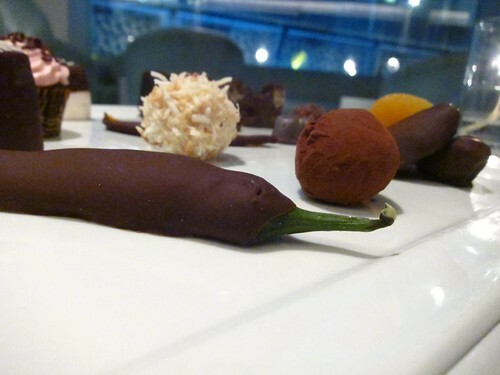 Chocolate covered serrano pepper, date, fig, candied orange peel, apricot. 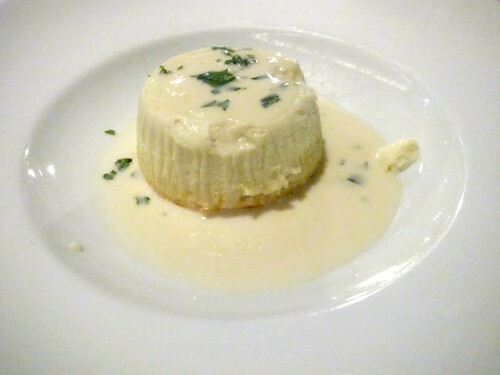 Coconut white truffle (another surprisingly good one for this non-white-chocolate lover). Raspberry chocolate cupcake (another one of our faves), malted milk chocolate truffle, bailey's truffle, earl grey chocolate. 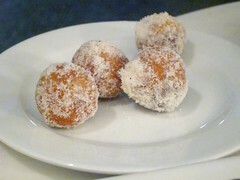 We finished off with warm nutella-filled donut balls. Everything we had was good, and there were some special highlights that I think unique to Oliverio's Chocolate Salon such as the triple chocolate truffle pizzetta and the hot white chocolate. Food coma? Big time. Call it chocolate coma. This isn't something you can do every night for after dinner dessert, for sure, but it makes for a fun night of indulgence, especially while sitting next to the pool on a nice night. This sounds like a great way to do a decadent dessert night and might be the perfect thank you for the boy who took take care of me while I was sick last week. Is the buffet AYCE? i.e. if there is something you really enjoyed, could you have seconds or thirds? Yep the buffet is definitely AYCE, whatever is laid out you can have as much as you want of. ThirstyPig: It's definitely for a date night :) Though maybe not a first date night if you want to gorge yourself ..